It has been eight years since the United States won gold in men’s basketball and this year’s team is making sure that that drought ends. Led by Kobe Bryant on defense and Dwayne Wade on the offensive end, this team has demolished its opponents in its first three exhibitions. Their average margin of victory has been 30 points, including a 36 point victory over Lithuania and a 32 point crushing of Turkey. Even more remarkable than the final score though, is how this team has played. Its defense has been nothing less than phenomenal. Kobe Bryant has embodied this defensive intensity as he has picked out the opponent’s best player and stuck to him. In US’s game against Lithuania, Kobe chose to guard European star Sarunas Jasikevicius, who scored 28 points in Lithuania’s victoryover the United States in the 2004 games. Kobe shut down Jasikevicius, holding him to just 9 points on 2 of 8 shooting. Kobe has shown the same competitive nature, the Jordan-esque instinct that made many people expect the Lakers to beat the Celtics in the NBA Finals. However, unlike the NBA Finals, Kobe is now surrounded by other superstars. He can focus entirely on defense and not worry about his offense. He doesn’t have to sprint up and down the base line, running off picks just to get an open look. With so many other excellent players on the court, Kobe can’t be double-teamed. No one on Team USA can be double-teamed, allowing every player to get open looks and easily beat defenders off the dribble. Kobe, Wade, and Carmelo Anthony are scoring with ease. They can focus on defense, knowing the offense will come. And unlike many past Olympic Teams, this year’s team does focus on defense. Not winning gold in 2004 was an embarrassment and this team is not about to let that embarrassment continue. They are focused and determined to bring back gold to the US. Wade has lead the team in scoring so far, averaging 16 points a game in less than 20 minutes of playing time. Coach Mike Krzyzewski has adopted many of assistant coach Mike D’Antoni’s philosophies on running the floor and getting easy transition baskets. This has lead the US to numerous fast break dunks. The defense is lead by Syracuse coach Jim Boeheim, who is the master of the zone and excellent at coaching man-to-man defense as well. On paper, Team USA is unbeatable, but on paper, they were unbeatable in 2004 as well. This time though, the Team isn’t making any guarantees. They realize that the gold isn’t going to be handed to them. They have the best team and they know it, but in order to claim gold, they have to play the best. 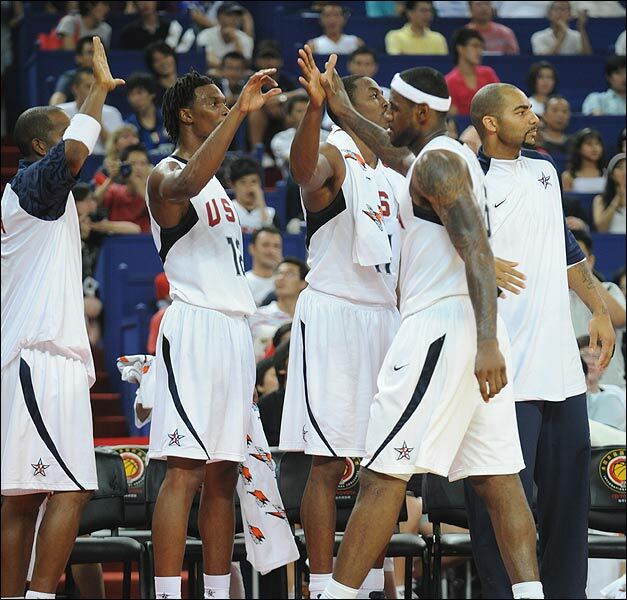 The first three exhibitions have proven that this time Team USA is ready to do just that.